Gulmohar Park in Ahmedabad Opened for business in late 2008. Located on Satellite Road, Gulmohar Park is spread across 5 floors and 220,000 sq.ft. offering an exciting variety of shopping, entertainment and food. Lifestyle brands like Promod, Charles & Keith, Chemisty, Tres Mode. Anita Dongre and Stephen Brothers are made available in the city for the first time. The youth have a wide choice from Planet Sports to Nike, Pepe, Lee Cooper and Spykar. Families can shop at Pantaloons, e-zone and Trident, while kids can raid UCB Kids, Lilliput, Scram, Gini & Jony and OYO. Mera Toy Shop houses a vast range of games and toys in a 5,000 sq.ft space. Ethnicity, a store with Everything Indian, was launched in India for the first time at Gulmohar Par. Spread over 30,000 sq.ft., Ethnicity offers a range of regular and high-end ethnic apparel, jewellery and accessories. Other national brands such as Biba, Kalanjali and TBZ also appeal to traditional shoppers. Gulmohar Park also has multiple fine-dining and especially restaurants such as Machaan, Mainland China, Rajdhani and Moti Mohal. Kids can have fun at interactive formats such as Hobby Idea, Make and Bake and F123. The design of Gulmohar Park is compact, giving it a boutique mall feel. Excellent signage and graphics make it very attractive and easy to navigate. Gulmohar Park has been designed with a special sunroof to keep out heat and let in natural light. This makes the mall eco-friendly and helps conserve energy. 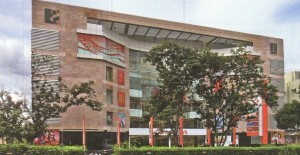 You can view the entire List of Stores and Shops in Gulmohar Park, Ahmedabad.